Just like the traditional type of advertising that has its own methods of transmitting messages, online advertising applies various methods to transmit its messages via a unique distribution channel and environment. The type of advertising and method of disseminating depends on many factors (see Chapter 11). 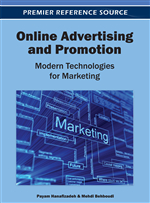 In this chapter, the authors introduce different methods by which the Internet advertising channel transmits advertisers’ messages to consumers. Banners are the most common methods of Internet advertising. A Banner is a graphic element 1.2 cm in width and 12.5 cm to 15.5 cm in length. A pixel is the unit used to compute and assess the digital content of banners. A banner usually includes the company name, product name and a short message (Figure 1). Banners motivate website visitors to click on their advertising message in order to transfer the visitor to the company’s or product’s main website. There are two entities who participate in publishing a banner. The first is the advertiser, who attracts visitors to the company’s or product’s website, and the second is the internet publisher who places the banner on the pages of the host website and is paid for this service. The banner is frequently placed at the top of the website’s page horizontally and may includes audio-visual clips. Clicking on a banner activates the A/V element, which loads and quickly displays the site linked to it. Keyword Banners: These banners appear when a user searches for a special word or keyword via a search engines. Random Banners: These banners introduce a new product, cannot be accessed from a link, appear on website pages randomly, and do not follow a special pattern. Fixed Banners: These banners are permanently placed on a page and cannot move to other pages of the website. Advantages: Banners are easily customized for a special user, and since they are small in size, they can be loaded within a short time, thus attracting and entertaining the user. From a statistical point of view, banners are visible for a long period. However, the main advantage of banners is their ability to be linked to their company’s host website from a simple click, and that they provide the user with more comprehensive information about the product and the advertiser. Disadvantages: Placing a banner on a popular website as a marketing effort may significantly deplete an advertising budget. In addition, the limitations imposed by the host website may impede transmitting messages to online customers. To alleviate these possible roadblocks, advertising designed two methods for placing banners on a website which enable them to display their banners with the least trouble (Amiri & Menon, 2003).